I haven't blogged about a food adventure in a looooong time!!! Weeeeell, I got busy and stressed from a lot of things I needed to do. The stress triggered my hereditary cholesterol to manifest very early, and then I had to curb all my food indulgences and watch over my diet. But for this blog post, even in a rare occasion, I'll be talking about mom and I's short visit to Papa Kim's bakery! Well, y'all know mom is shy, so she has no photo here. But we went together to explore the place. 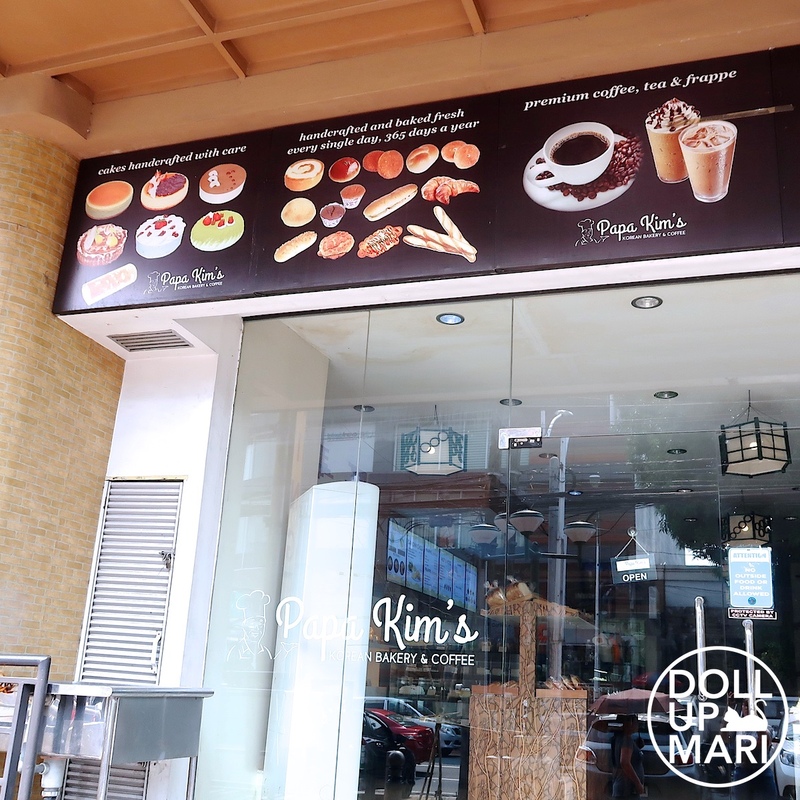 I went to the Tomas Morato branch. It's 270 Tomas Morato, or if you need a landmark, look for the BDO branch and you'll find this beside the BDO on Tomas Morato. 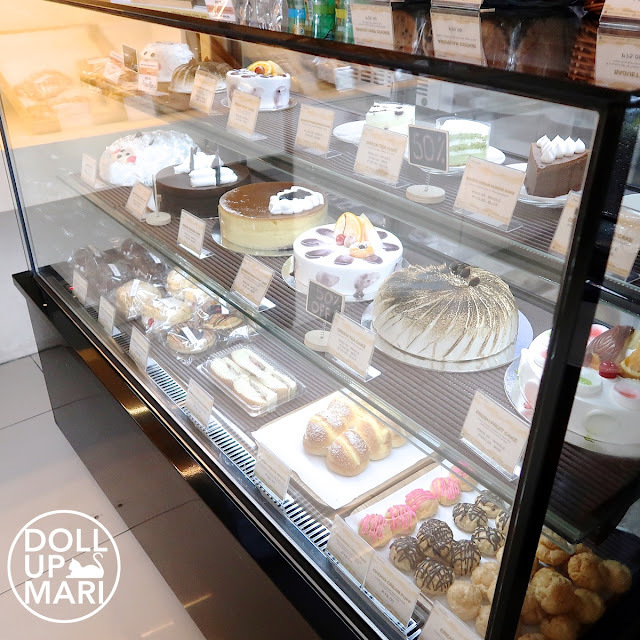 The interiors may be the usual interiors for a bakery, but when you come into closer inspection with all the goodies, it really will remind you of a bakery in Korea. The staff shared to us that a lot of their chain's customers are Koreans. And most likely, it's in an effort to combat homesickness by visiting a place that feels so Korean. Not in this photo are their new rice bowls, and japchae. The rice bowl and japchae are sooooo goood that there is no wonder why a lot of people flock to the place. Those were the two things I was not able to photograph because the moment I got home, the two dishes disappeared in thin air with all the happy diners. But trust me, you gotta try them. Speaking of Papa Kim, yes, we also tried asking if he were here in the Philippines. Unfortunately, he's back in Korea. 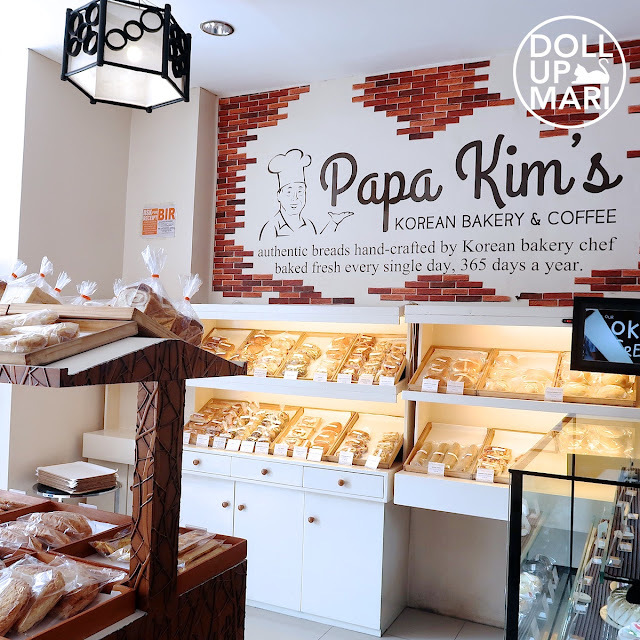 They should prolly do a fanmeet featuring Papa Kim with all the fans of the bakery now! And look at their Bear Breads!!! Tooooo cute!!! Their Bear Breads range from Php48-55, and if you buy two dozens of Bear Breads, you can get a Bear Bread pillow for free! If you look at the styles of bread they have, the feel really is very Korean. 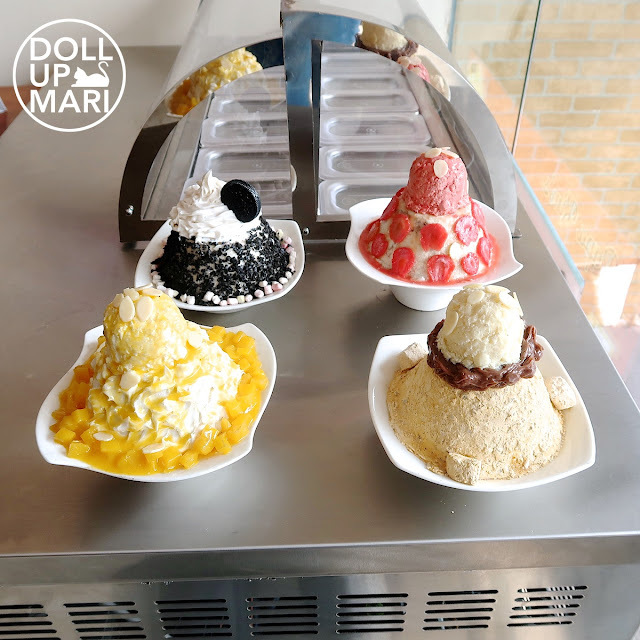 They have Fresh Cream Castela (Php220), which is technically European in origin but something so popular in Japan and Korea. 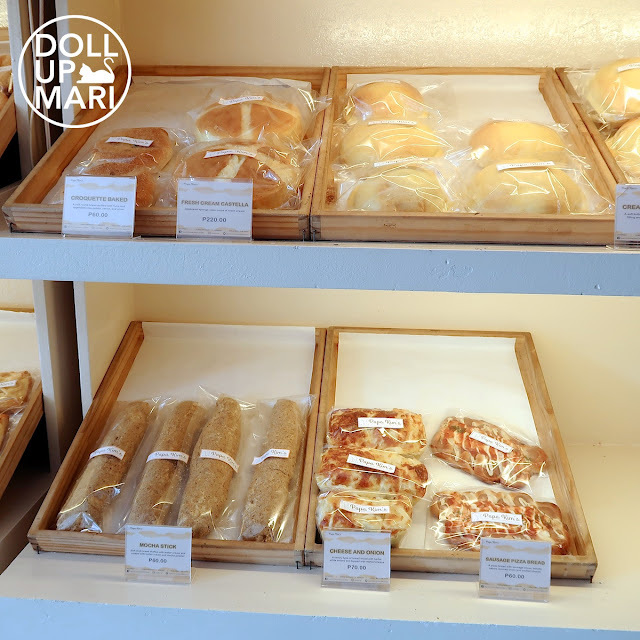 They also have Croquette Bread (Php60), which my brother highly raved about. The Mocha Sticks (Php60) also have a highly Korean feel. 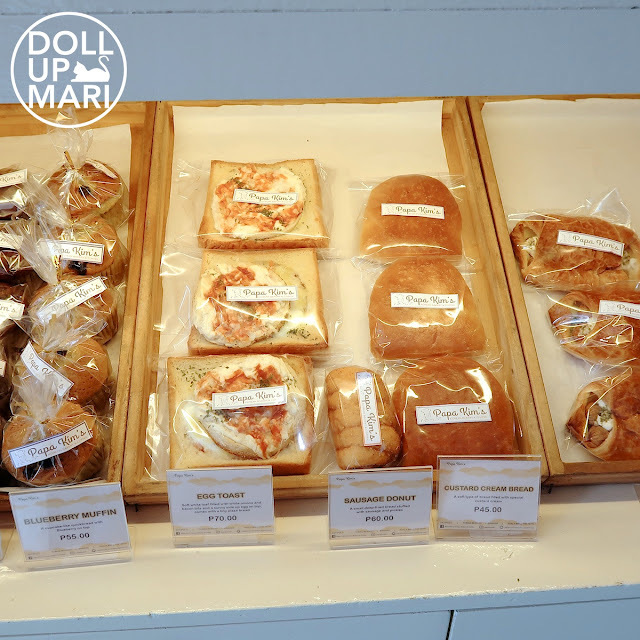 Only the pizza breads are the breads which I can imagine seeing in a Western chain bakery. For those looking for something more of the "usual", they also have muffins and the like. 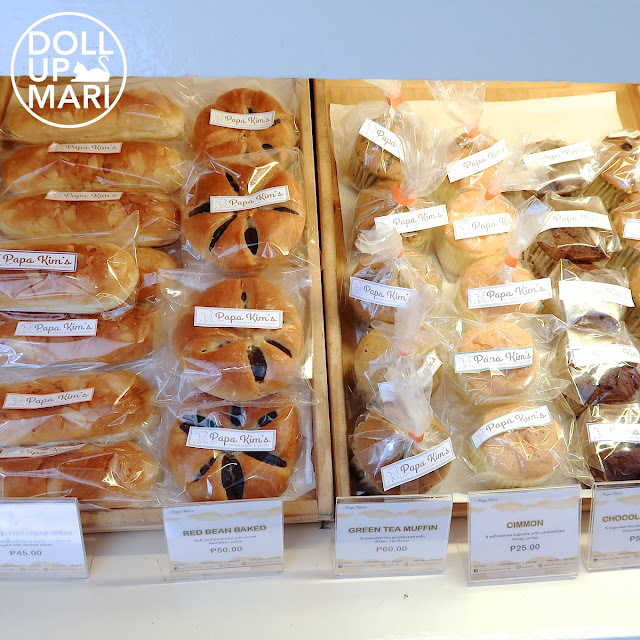 They have chocolate and blueberry muffins (Php55 EA), and even green tea muffins (Php60)! They also have red bean bread (Php50) for those who love read bean. 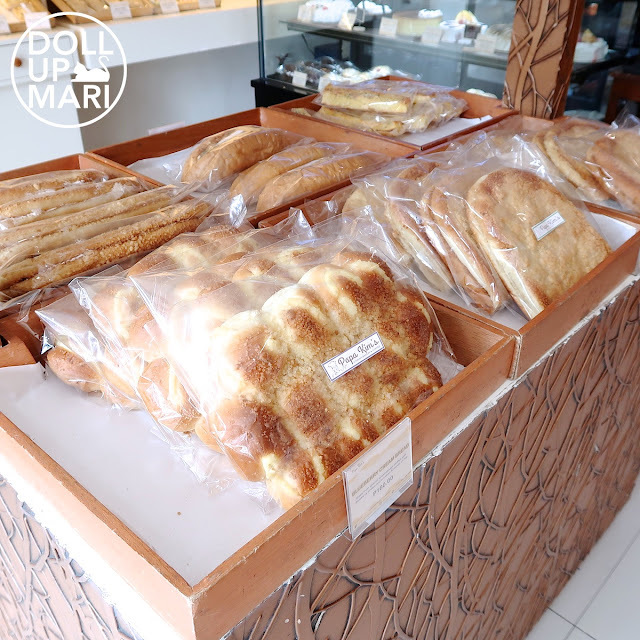 For those who want to have breakfast breads, maybe their Egg Toast (Php70) should do the trick? I haven't seen a lot of other places to have whole cooked eggs on the bread, because usually they add in the egg into the batter... I find this quite practical for those who wish to only pop one thing into the oven and already have a full breakfast. 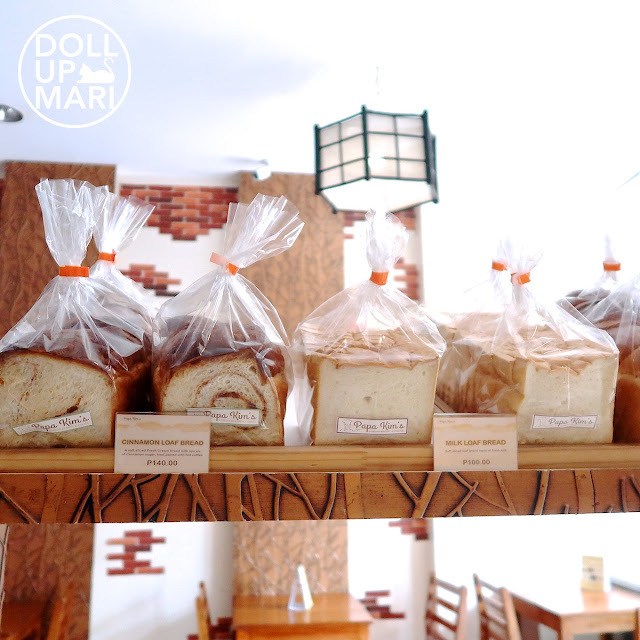 For those who are looking to try new types of loaves, y'all can also try their Cinnamon Loaf Bread (Php140) and Milk Loaf Bread (Php100). If you're looking for a loaf with a touch of butter and powdered milk, then the Milk Loaf Bread is for you. There wre soooo many cute cakes and cream puffs!!! But this is the shelf that we had to consciously stay away from coz our cholesterol is high. Had it not been for our cholesterol, we definitely would've tried some cakes coz they're so good! 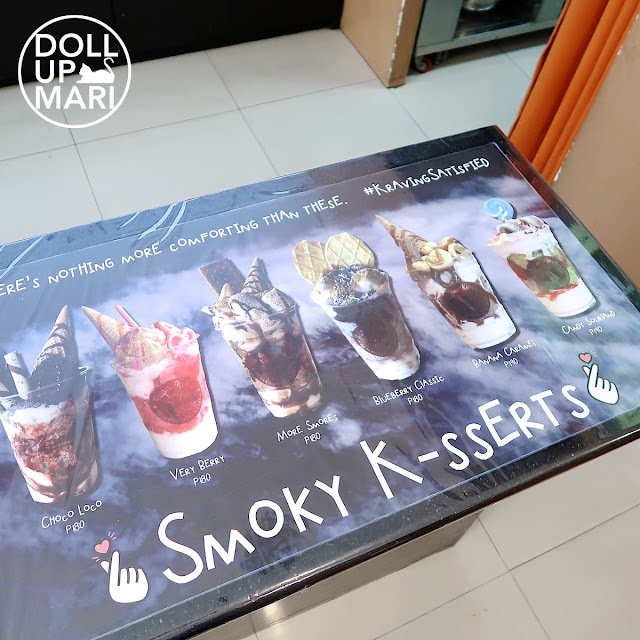 Their new menu offering is their Smoky K-sserts! There's a flavor offering for all kinds of tastes. I recommend having this with a friend as the serving is quite big. Yeahp, this is what I mean by smoky! But no, the blue liquid is not part of what you're supposed to eat. It's just there to make things more interesting. 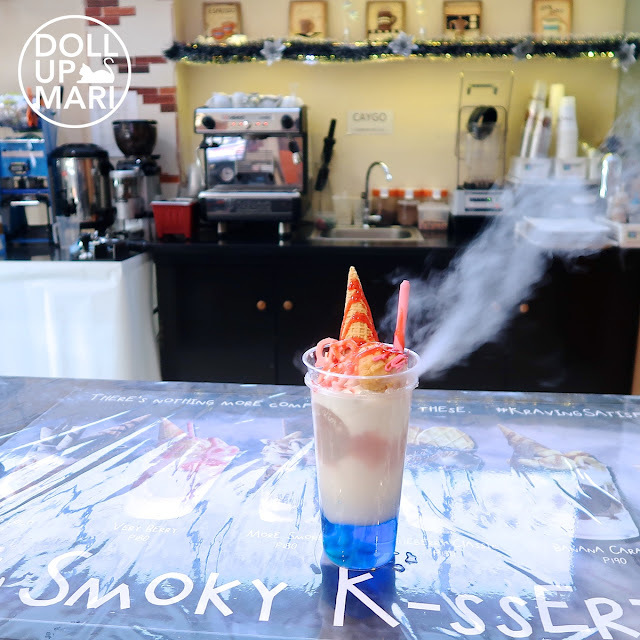 I got their Very Berry Smoky K-ssert (Php180), which features soft serve, strawberry syrup and candied strawberries (like the ones they place on top of cheesecakes), little biscuits, a cream puff, and a small cone. Perhaps right at this moment as I type this that there is a storm, maybe this is not the exact thing one might think of having. But for the days when there is no storm and we're all dying of the heat, this is a highly refreshing treat. Yaaaay, that's a wrap! Till the next foodie adventure (which is still far away hahaha).